I was born in 1979 and grew up in Wolvega, The Netherlands, where I spent my first 20 years. After having completed a degree in marketing and communication I went to the Art Academy in Kampen to study painting. I graduated in 2004 and received a starter’s stipend to develop my work further. In 2006 I was nominated for the Buning Brongers Prize. In 2007 I settled down in Assen, The Netherlands. Alongside my painting I have focused on educational and community art projects. From childhood art has had an attraction to me. Because of this I felt the urge to start making work myself. Just about anything around me can function as an inspiration to me. The main theme in my work is the creation. 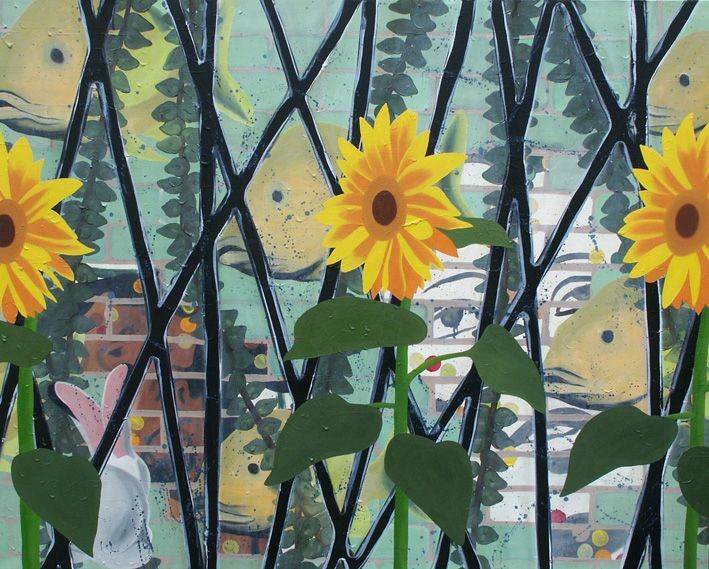 I often make use of symbolism, like doves, fish and sunflowers. My biggest challenge is to integrate my personal emotions and convictions in a subtle manner into my work. My hope is that every viewer may be touched by my work, if only to a small extent, which desire springs my social character and faith. That is also the reason why I am involved in community art projects. It is my hope that through them many people may have an experience of community and art. In this way I want to make people aware of God’s grandeur and creation. 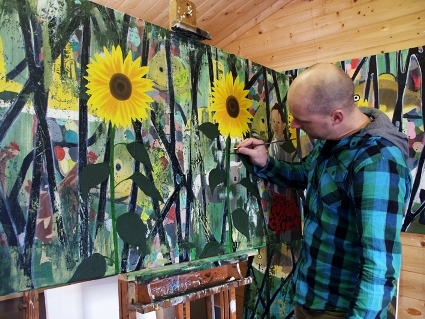 In my work I use a combination of various painting techniques, through which I try to develop a new visual language. I use mainly oil paint, as this allows me to work with thick layers of paint. The combination of these with smoothly painted elements produce an alienating effect that I find interesting. 1. With Three Sunflowers, a Rabbit, a Dog and a few Fish (The Trinity 1), 125 x 100 cm, oil on linen, 2011. This painting is about the creation. The three sunflowers symbolize the Father, Son and Holy Spirit. 2. 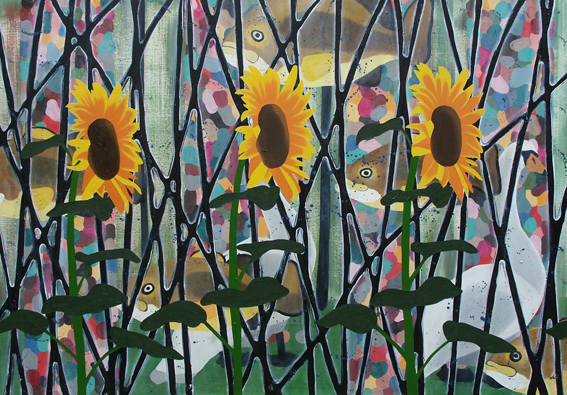 Three Sunflowers (The Trinity 3), 145 x 200 cm, oil on linen, 2012. 3. 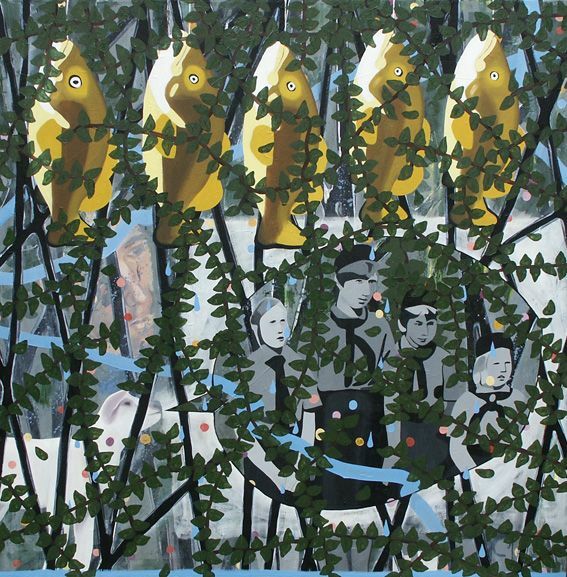 With Five Fish, 140 x 140 cm, oil on linen, 2011. This painting contains many different elements. 4. 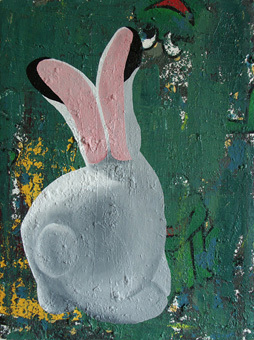 Rabbit, 22 x 29 cm, oil on linen, 2009. 5. 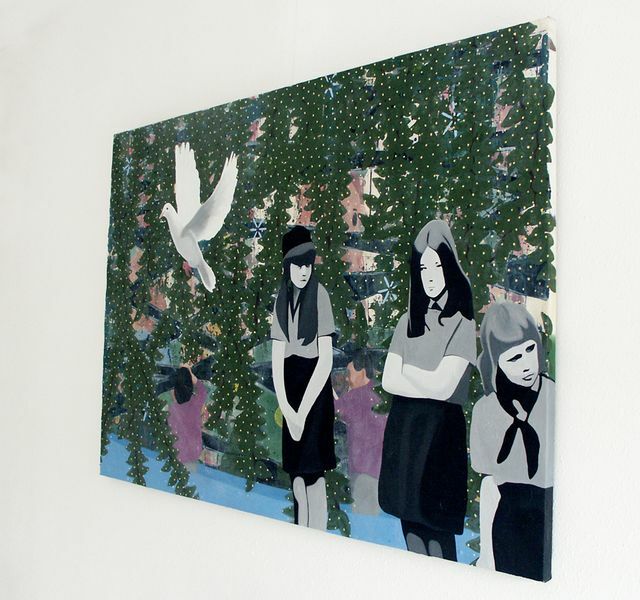 Waiting, 124 x 86 cm, oil on canvas, 2011. The three waiting girls are not aware that what they are waiting for, the peace dove, has already arrived. a. De Wouden 166, 9405 HP, Assen, The Netherlands (studio).